FishEyes Rod & Reel Puts A Camera Right Above Your Bait | OhGizmo! Unless you’re casting into a well-stocked pond, fishing can be incredibly boring while you wait for something to take your bait. In fact I think it just serves as a plausible excuse for spending countless hours drifting on a lake in a canoe. But the makers of the FishEyes promise to take the boredom out of waiting because they’ve created a rod and reel that features an integrated wide-angle video camera at the end of the line, sitting just above your bait. The live video feed is sent to a color LCD display built into the handle, so you can see the fish as they swim by. But it doesn’t do anything to actually encourage fish to take a nibble. In fact, I’m pretty sure the built-in LED lights it uses to illuminate your bait underwater would probably serve to scare the fish away. And if the fish aren’t biting, seeing a murky live feed of nothing happening underwater isn’t any more exciting than sitting and waiting. 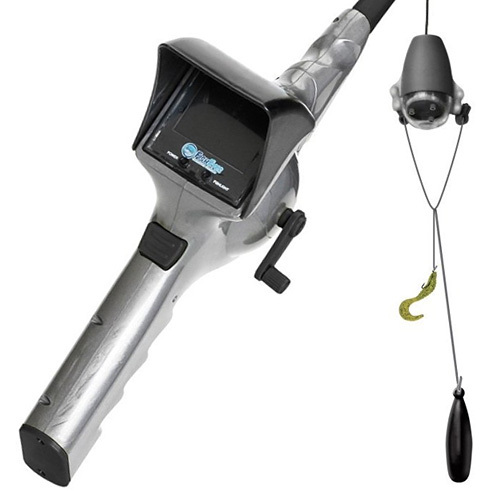 Finally, according to this incredibly cliched infomercial, the FishEyes only has a little over 25 feet of line, which could make fishing off a tall dock pretty much impossible. Well, the most incredible thing about this thing is the angle view from the commercial. What do you think when the ad don’t show any real footage FROM the actual rod?